We’ve all heard of AM, FM and now digital radio but have you heard of fast radio bursts or FRBs? Possibly not, but like your local radio station, FRBs are a source of radio waves, only they come from far far away. Your kitchen radio detects those sent from your local radio stations while our radio telescopes (think of ‘The Dish’ in Parkes) detect radio waves from space which are studied by our astronomers. Fast radio bursts are quite a new discovery in the world of radio astronomy. The first was found by our Parkes radio telescope in 2007 and only 17 more have been detected since. But one of those 17 bursts was exceptional, dozens of times brighter than any burst other than the first. This burst was captured – again, with Parkes – and analysed by a mostly Australian team. Details have been published today in the journal Science. And it has provided our astronomers with a unique glimpse of the gas that lies between galaxies. Dr Ryan Shannon, of CSIRO and Curtin University, co-led the team with Dr Vikram Ravi of Caltech in the USA. Ryan says the flash in question, FRB 150807, came from a billion light-years away. “The flashes are extremely fast and this one was the briefest ever observed, lasting only a third of a millisecond,” said Dr Shannon. Despite being a large component of the ‘normal’ matter in the Universe, intergalactic gas has been extremely difficult to study because it is so diffuse. It does, however, alter the characteristics of radio waves passing through it. For the first time, using the signal from the FRB, scientists have been able to measure the gas between galaxies and have confirmed that the gas is very calm and has very weak magnetic fields, which is what scientists predicted but had never been able to measure. 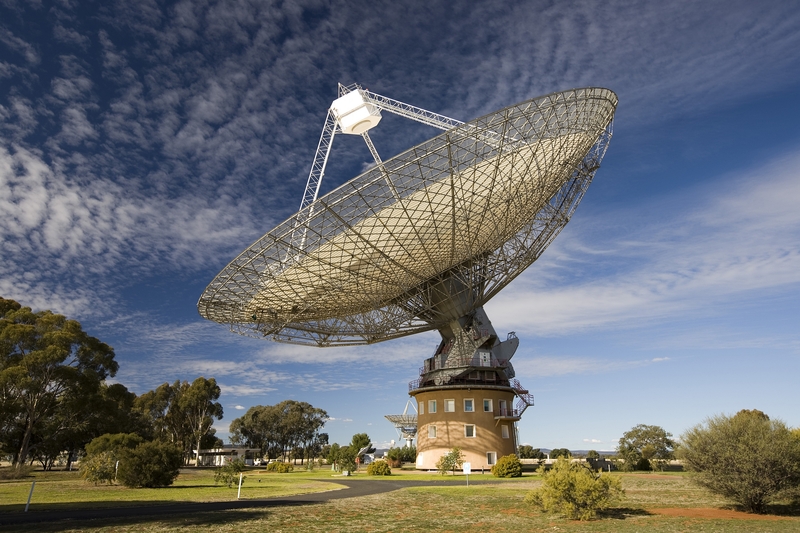 The astronomers found their new fast radio burst using instrumentation designed and built by Swinburne University in collaboration with CSIRO, and by observing with both our Parkes radio telescope and our Australia Telescope Compact Array. Although what causes FRBs is still a mystery, we have added to our knowledge of them and believe that bursts aren’t uncommon, with perhaps between 2000 to 10 000 going off all over the sky every day. Our newest telescope, ASKAP, with its wide field of view may detect many FRBs in the future. 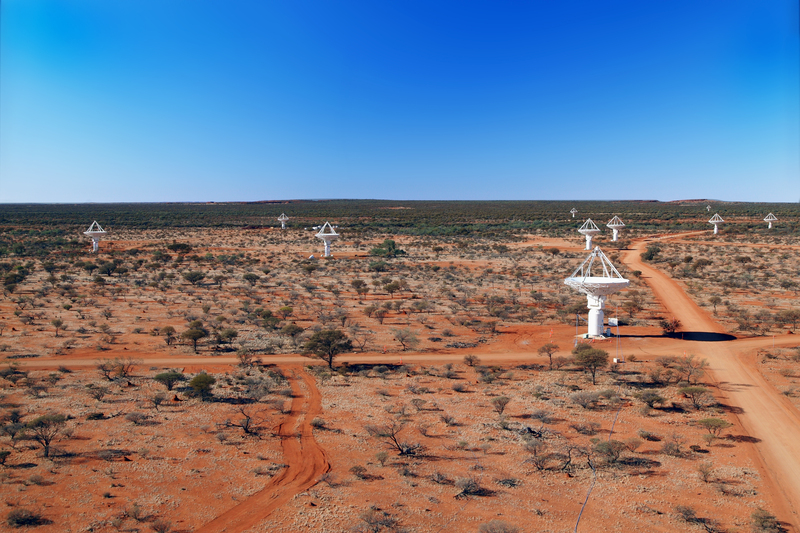 Ten ASKAP dishes at the Murchison Radio Observatory site. Our newest telescope, ASKAP, with its wide field of view may detect many FRBs in the future. We acknowledge the Wajarri Yamatji people as the Traditional Owners of the Murchison Radio-astronomy Observatory site. The researchers involved are affiliated with CSIRO, the International Centre for Radio Astronomy Research/Curtin University, Swinburne University, the ARC Centre of Excellence for All-sky Astrophysics (CAASTRO), the Australian National University and Manly Astrophysics; California Institute of Technology (Caltech) and the National Radio Astronomy Observatory in the USA; the SKA Organisation in the UK; and the Max Planck Institute for Radioastronomy in Germany. Way to go Ryan and Vikram!